One of the first things I did when I woke up this morning was to check CNN’s website to make sure that the Outer Banks were still there. I was pleased to discover that everyone is ok, but something else on the homepage surprised me. 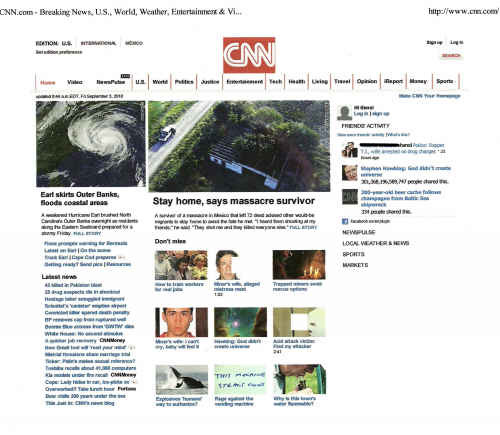 CNN has been experimenting with ways to make their site more interactive, and one of the latest is a Facebook plugin. Whenever my Facebook friends share a CNN article, I can see that information on the CNN homepage (along the right side). I was a little shocked by how popular one of the articles was, and I took a screen capture of it. Considering there are approximately 7,000,000,000 people on the planet, I’m pretty sure that CNN does not have 300,000,000,000,000 readers. You normally only hear about numbers like that when people are discussing the attendance at political rallies. You had me roflmao with that last sentence! your last sentence could also mean each individual of the 7,000,000,000 people shared the article 43,053 times on Facebook accounts.